From Little Rock, you’ll be driving quite a while down Interstate 30 toward Texarkana. Take exit 31 in Hope and head south on Hazel Street (Highway 29) for half a mile. Terry Powell’s Grocery is on the left at the intersection with Greenwood Street. Terry Powell opened this little grocery store and gas station in the mid-1980s. Basically a glorified convenience store, the businesses became a huge hit with the locals for its friendly service and easy access to regular grocery supplies. In the 1990s, Powell began serving his signature cracklins, which had people crossing state lines to get a bite. Powell retired and sold the grocery store to his son, Colby, in 2014. Terry Powell’s Grocery might do any number of things well, but its piping hot cracklins are the stuff of legend. Cracklins are similar to pork rinds, but with far more meat and fat. Terry Powell’s uses skin-on pork belly for its recipe, chopped into one-inch pieces and breaded in a house-made batter that is heavy on black pepper. The cracklins are then fried until they pop (or “crackle”) and the fat on the inside is just on the verge of its melting point. Let me tell you, when you get that initial crisp, first bite that dissolves into perfect porcine pleasure on your tongue, it’s a food experience up there with some of the best rural Arkansas has to offer. Demand for these cracklins is so high that Terry Powell’s fries them up and ships them all over the country (there is a 10-pound minimum to ship). Colby Powell tells me their farthest regular customer lives in Compton, California, if that tells you how addictive these things are. Terry Powell’s also serves up plenty of southern food staples, like fried catfish, smoked turkey legs and barbecue pulled pork. They also sell deep fried rib tips, which I found enjoyable. It takes some gnawing and napkins (just like ribs), but the meat is pretty tender and seasoned nicely. Still, I would forgive you if you ignored everything but the cracklins. Nothing at Terry Powell’s Grocery could be called expensive. 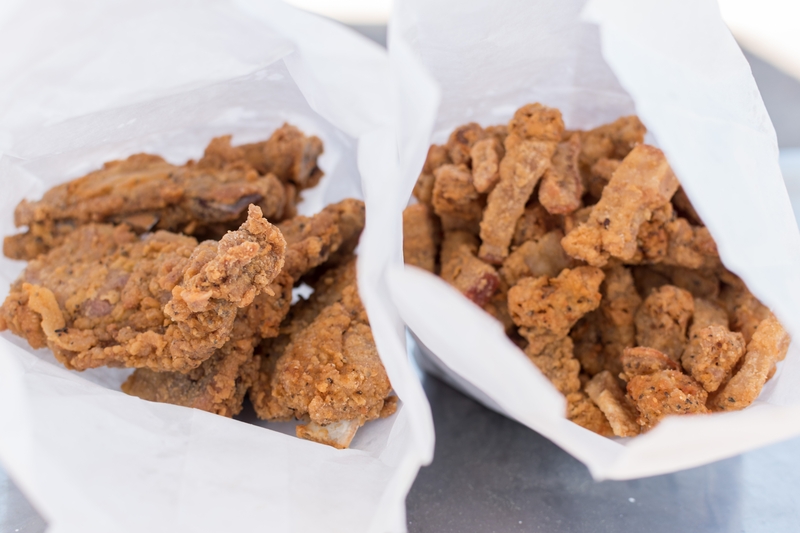 Cracklins are sold at a rate of $8 per pound, and nothing else on the menu is that expensive. Rib tips are $6 a pound, and plenty of lunch items cost between $2 and $5. Terry Powell’s does accept credit cards, though there is a $5 minimum charge. I placed an order for a pound of rib tips and a pound of cracklins so I could get some photographs. My plan was to snack on a few of them and save the rest for later. I succeeded with the rib tips. I failed miserably with the cracklins, downing the whole pound in a single sitting. The cracklins at Terry Powell’s Grocery in Hope should rank right up there with with Ms. Rhoda’s tamales and Charlotte’s pies. They’re that good, practically worth the trip all by themselves. They are definitely a must-get anytime you are heading toward the Texas border.